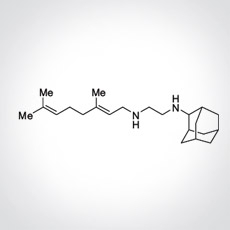 SQ109 is a novel 1,2-ethylene diamine small molecule drug with 3 unique mechanisms of action that are distinct from other antibiotics used for the treatment of tuberculosis (TB). Phase 2b study completed and published in Russia: Borisov S.E., Bogorodskaya E.M., Volchenkov G.V., Kulchavenya E.V., Maryandyshev A.O., Skornyakov S.N., Talibov O.B., Tikhonov A.M., Vasilyeva I.A. EFFICIENCY AND SAFETY OF CHEMOTHERAPY REGIMEN WITH SQ109 IN THOSE SUFFERING FROM MULTIPLE DRUG RESISTANT TUBERCULOSIS. Tuberculosis and Lung Diseases. 2018;96(3):6-18. https://doi.org/10.21292/2075-1230-2018-96-3-6-18. From the Abstract: The objective of the study: to assess efficiency and safety of SQ109 used within standard treatment regimens for multiple drug resistant tuberculosis (MDR TB). Subjects and Methods. A multi-center, double, blind, randomized, placebo-controlled study was conducted in two parallel groups from September 21, 2012 to September 30, 2016, in 6 research centers located in 5 cities of the Russian Federation. Main results. 1. Cessation of bacillary excretion confirmed by cultures on liquid media by the end of the 6th month of the intensive phase of chemotherapy in pulmonary MDR TB patients receiving SQ109 was observed confidently more often versus treatment regimens containing only existing anti-tuberculosis drugs: both for ITT population (61.0% versus 42.9%, p = 0.0412), and PP population (79.7% versus 61.4%, p = 0.0486). 2. There were no statistically significant differences in the achievement of sputum conversion between the groups, but by the end of the 8th week, the sputum converted in 52% of patients in the group treated with SQ109 versus 38% in the group taking a placebo. The median time of bacillary excretion cessation confirmed by culture on liquid media in SQ109 group made 56 days, while in the placebo group it was 84 days. 3. Use of SQ109 along with basic chemotherapy for pulmonary MDR TB did not result in the higher frequency of adverse events, worsening of their severity, development of new variants of adverse events compared to the basic anti-tuberculosis treatment of this group of patients in combination with placebo. 4. Results of the study allow concluding that SQ109 is an effective drug, satisfactory tolerated (compatible with tolerability of placebo) being a part of integral etiotropic chemotherapy of pulmonary MDR TB patients. In prior laboratory studies, SQ109 demonstrated excellent activity against both drug susceptible and multidrug-resistant M. tuberculosis, including extensively drug-resistant TB strains. SQ109 also enhanced activity of anti-tuberculosis drugs isoniazid, rifampicin, and bedaquiline and shortened by >30% the time required to cure mice of experimental TB. SQ109 could replace one or more of the current TB drugs, simplify therapy, and shorten current treatment time. Infectex, Ltd, licensed the rights to develop and commercialize SQ109 in the Russian Federation and Commonwealth of Independent States from Sequella, Inc., in 2011. SQ109 is currently under Sequella’s US IND and completed three Phase 1 studies in the U.S. and two Phase 2 studies in drug-sensitive TB patients in Africa in addition to the Phase 2b-3 study in Russia. Infectex and Sequella Press Release.2017.